Note: This is NOT a paid or compensated review, but a review of a company that I’ve purchased products from. I enjoy sharing information about companies that provide great value and service and you’ll always receive my honest and unbiased opinion. I’ve been ordering food and pet supplies from Chewy for quite a while now and I’ve been thoroughly impressed with the company, but what they did last week for my mother just blew me away. Here’s why I love Chewy.com! It’s been a pretty rough year for my family, as my Dad had been sick most of the spring and summer, then passed away last month. It’s been most difficult on my mother, but at least she had their senior dog Lucy to keep her company through it all. Sadly, one evening last week Lucy passed away. My mom had just ordered a case of food from Chewy that arrived earlier that day. She contacted them a few days later to see if she could return the unopened package. A very caring customer service representative listened to my mom and offered her very sincere condolences. Chewy refunded the entire order and asked my mom to donate the food to a local shelter in Lucy’s name. 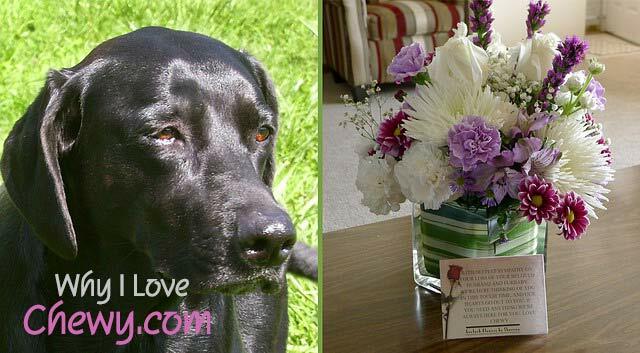 My mom was utterly surprised a few days later when a beautiful bouquet of flowers showed up at her door—from Chewy.com! My mom was so touched by this thoughtful gesture, I just had to share this with you. What an amazing company! Chewy also cares about pets, of course. They even have a program to support registered, non-profit organizations that do so much to help pets and shelters in need. Let’s face it, we all like saving money. Chewy has low prices on almost everything they carry. It’s much cheaper for me to order Haley’s food from Chewy than to purchase it from any of my local, chain pet stores. With warehouses all over the country, Chewy can usually get your order to you within 1-2 days. They only ship within the contiguous US, but if you order by 4:00 pm EST, your order will normally ship the same day. All of my orders have arrived within 2 days shipped via FedEx. Besides getting your pet food, toys and supplies at low prices, Chewy will ship your order for free, if your order totals $49.00 or more. If your order total is less than $49.00, it ships for a very reasonable flat fee of only $4.95! Do you want to save even more money? Choose the Autoship option when you place your order. You tell Chewy how often you want a product shipped and they make sure it arrives on your doorstep when you need it. Autoship is easy to set up and you can pause, change or cancel shipments at any time. No more running out of food if you forget to reorder. Chewy.com wants you to be satisfied with your purchase. That’s why they offer a 100% Unconditional Satisfaction Guarantee. They give you 365 days from the sale date to return any item you’re not completely happy with, for any reason. You get a complete refund and they’ll even pay for the return shipping. Just call one of their customer service reps at 1-800-672-4399 for more details if you need to return an item. If you have a question or problem, Chewy’s customer service is available 24/7 by phone, email or online chat. You’ll get a real person on the phone that’s responsive and knowledgeable, ready to help with whatever you need. Chewy carries around 18,000 items for dogs, cats, fish, birds, small pets and reptiles! Everything I’ve purchased at my local, chain pet store is also available on Chewy’s website, usually at lower prices. I’m impressed with Chewy’s selection of high quality foods, many of which can’t be found at the local big-box pet stores. You can also be assured you’ll receive fresh food when you order from Chewy. The clean design and usability of Chewy’s website makes it simple to order (and re-order) your pet supplies. It’s easy to search for items and view a history of your orders, as well as track orders that have already shipped. Chewy.com was founded by people with a passion for pets, and it shows. I have to apologize if this article reads like a sponsored post. It is not. I just believe in supporting and rewarding companies that go above and beyond and this is certainly the case with Chewy. 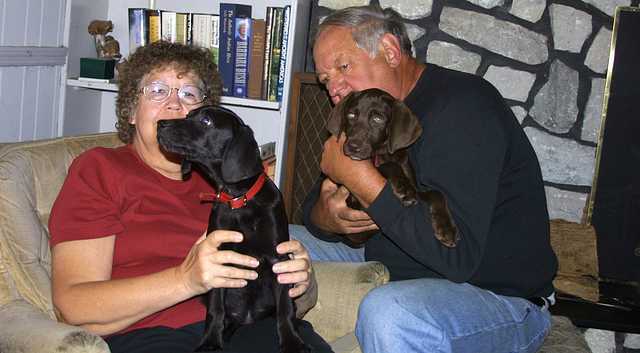 Here’s a picture of my parents when Lucy and her sister Nikki were puppies. I’m sure my Dad is up there somewhere, playing with the dogs, laughing and giving lots of belly rubs. Thank you Chewy for bringing my mom some joy last week with your very compassionate and thoughtful gesture. The flowers are gorgeous and it gives me even one more reason why I love Chewy.com! Have you tried Chewy.com yet? Thank you so much, Hazel.? I was really surprised by how thoughtful Chewy was too. Amazing company! Oh my, how much more can your sweet mom take. I am sorry to hear about Lucy’s passing. You have certainly sold me on giving Chewy.com a try. When I saw the first TV commercial I went in and took a look. Time to go back in. Knowing how thorough you are I really appreciate your endorsement. Tell Haley Chops says hello. Thanks Sharon and Chops! My mom’s doing pretty well considering. She’s been really strong through it all and maybe one day she’ll be ready to welcome another dog’s love.? Looking forward to seeing you around the holidays! First, my condolences for your loss. My heart goes out to your mom. How utterly heartbreaking to lose one’s husband and then a furbaby. I’ve been purchasing my girls’ food from Chewy now for nearly two years. And now that I have them both on a food that doesn’t aggravate their IBS, I don’t buy it from any other company. Same goes for their treats and other supplies. Thanks so much for your caring thoughts and words. Our pups really provide so much love and comfort, don’t they? So glad you love Chewy too! I have ordered from Chewy.com and really appreciate them. Now our much loved 11 year old GSD also has IBD. She is doing well on a unique protein from the vet, but it is pricey. 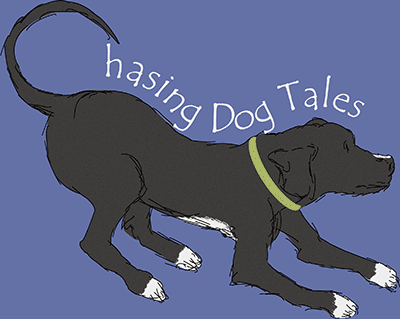 What have you found that works for your dogs? Thanks for your information. Hi Nina! Sorry for the delay in responding. For my senior girl, I am using Hills’ Ideal Balance Chicken and Zucchini stew. I had been using the turkey and vegetables recipe but they discontinued it so I had to find something similar. Shadow seems to like this even better. And, I mix in some of the Science Diet Sensitive Skin and Stomach kibble. For Ducky – who suffers more frequently from the IBS – I use the Hills’ Prescription i/d canned pâté but am transitioning her to the chicken and veggie stew formula and kibble, which she seems to like better. The pâté is just a pain to use – it sticks to everything! While Ducky will eat anything I give her, the stew formula seems to be her favorite. Thanks Callie, I appreciate the information! Hi Elaine. I am so sorry for your loss of your dad. My heart goes out to you and your mother. I am sorry for your mom’s loss of Lucy, too. Thank you for sharing your experiences with Chewy. I have never used them but, based on your post, I checked out their price on the dog food that I buy for my golden retriever Savanna. I was surprised to see that it is much cheaper on Chewy than it is at Petsmart. I guess I’ll be checking out Chewy the next time I need something for my dog or cat. Hi Rachele! I think you’ll love the prices and quality of service from Chewy. Give it a try and let me know what you think. Thanks so much for your caring condolences and I’ll send your kind thoughts along to my mom as well. I’m SO sorry for the loss of your Dad and Lucy – what a beautiful gesture from Chewy. I’ve been an influencer for them for over a year now and I love the company and how thoughtful they are. Sending you hugs from our pack. I feel very sad for your Mom. We’ll thankfully take those pack hugs, Christine. Thanks you!? Chewy truly is a one-of-a-kind company, aren’t they? Chewy is great. I am so sorry for the losses your family has been though in such a short time. I hope your mom gets another pet. Thank you so much, JoAnn. I think she probably will get another pet sometime. There are so many wonderful dogs out there that are looking for a loving home and will give so much love and joy in return. No need to convince us…we just put in another order. It is so easy to get what you need, super fast, and priced well. Another happy Chewy customer.?? Thanks for sharing, Emma! ? Elaine, I am so very sorry to hear about the loss of your Dad, and then losing Lucy so soon afterwards… my heart goes out to you and your Mom. Sending hugs your way! And I love, love, love Chewy… great prices and super-fast shipping. And after reading about the lovely gesture they did for your Mom, I love them even more!! Me too! I already loved Chewy but this kind gesture was amazing and so unexpected. I really appreciate your kind words and condolences, Camille. Thank you!? Reason #1 is good enough for me! That’s so great when companies recognize our losses like that. It’s definitely good business to treat customers well. I sure wish other companies would recognize the value in that. It creates amazing brand loyalty. My goodness, I haven’t heard a customer service story like that in a long time. What an amazing, heartfelt expression of sympathy for your mother. It brought tears to both of our eyes. The flowers were gorgeous and it was such a caring and compassionate thing to do. Chewy.com really feels like family to us too. So sorry to hear about your losses, my prayers will include you, your mom and the rest of the family. 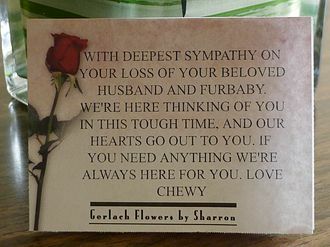 Chewy.com reached out to us when Leo died, I too was speechless with their display of love and concern. This pet loving, pet friendly community we belong to is special in many ways. Boy are you right about the loving and caring pet community, Cathy! Thank you so much for including all of us in your thoughts and prayers.? Elaine, I am so very sorry for your & your mom’s loss. We will be thinking about your family. That was an incredibly touching gesture of Chewy and certainly speaks for their high level of customer service. It is so nice to know that there are still companies out there who truly care about their customers. Thank you so much, Barbara. 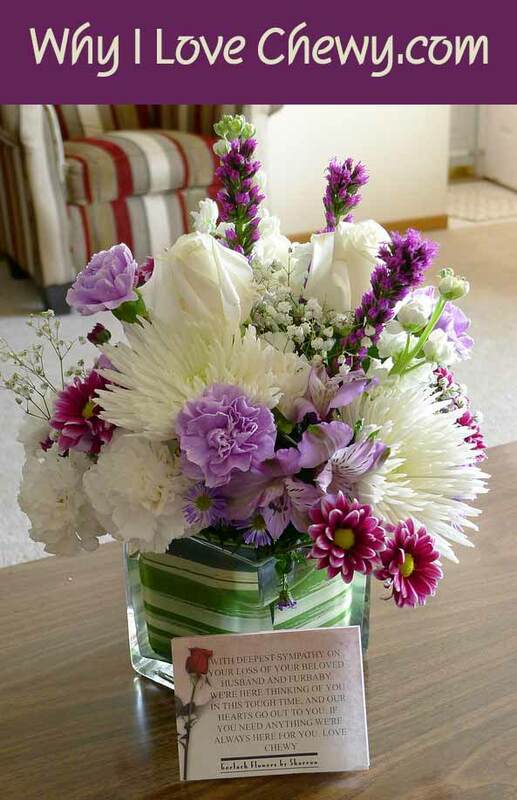 It was such a touching and unexpected gift for my mom and it really brightened her week.? I’m so sorry for the loss of your Dad, and please express condolences to your Mom on both of her losses. I can only imagine how tough that has been. What a wonderful and kind thing Chewy did! I have been very pleased with them as a company as well. We order almost all of our pet supplies for them. The free and fast shipping and great prices is enough, but their customer service is impeccable! One time I ordered a toy and they accidentally sent 4 of the toy. Nope, they didn’t want them back – just said to donate them (I gave them away on the blog). Another time I forgot something in my order and emailed them to ask if I could still add on to the order. The next minute the phone rang, and they were calling to see what I needed to add! They really are amazing, but what they did for your mother is the best. Thank you Jan for your kind thoughts and words. I’m so glad you’ve had such a wonderful experience with Chewy too. Don’t you just love supporting businesses that care and understand the value of great customer service? I hope more companies will notice the positive business karma that comes from treating customers well. Too you, your mom and other family members: Our deepest sorrows, thoughts, and prayers during this difficult time! …and wow, what you describe is exceptional care and service on Chewy’s part. We love that and know it is extremely tough to find these days. We can all “take away” something from your story. Thank you so much, Donna. It was so nice of you to stop by and share your kind words.? I’m giving Chewy a try. I ordered today at around 2 EST and it has not shipped yet. Maybe because it’s Friday? Anyway I will update with how it goes. Their prices are great. Can’t use them for single cans of dog food though since I get a variety of types and it appears they only sell by the case which is understandable online. The treats I ordered are $2 cheaper per bag than at leading pet food stores. Hi Mary! I hope you were happy with your order and it arrived quickly. So glad you saved a little money too! ? Prayers for you and your mom. It seems hard times come in groups sometimes. I so appreciate your posts and information. I have been impressed with Chewy.com but your story tops it all. Thank you for sharing! Thank you so much, Nina. ? I remembered that old saying that death comes in threes and recently an old family friend passed away too. Maybe we’re all good here for awhile now. Update: I ordered on a Friday afternoon and the package arrived Tuesday afternoon. Great service! I will use them again. Thanks for sharing them with us. I just found your post, and while very late, I m sorry for all the losses your family experienced. The silver-lining is kindness shown by Chewy.com. I’m sad for what you experienced, but I’m glad to see that this truly is their culture. I lost my baby kitty 15 months ago (she wasn’t really a baby at 18.5 years, but she was to me) and when I lost her, and I had a delay in an order for my newer skittens, they did everything to offer a bit of kindness. I received some roses a few days later, and like yours, the message was personal and kind. A company that can still make money, but also support a culture of kindness is too rare these days, and I appreciate knowing that this is the rule and NOT an expection. I’m glad that you posted this, and share your love for this company.